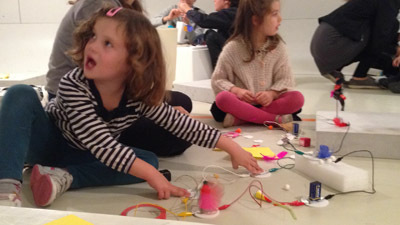 In collaboration with Odile Fayet and Marie-Claude Beck from Pompidou Center in Paris, I designed and set up a family-oriented creative workshop using electricity and circuits: “Je suis une vraie pile électrique !” (From a french idiomatic meaning that a kid is unable to stand still. Literally, “I’m a real electric battery!” ). 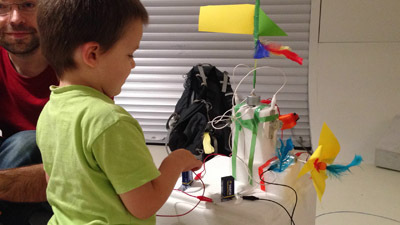 In “Je suis une vraie pile électrique !” the emphasis is on the wonder of building and interacting with electric circuits: switching on and switching off a circuit, making something strange or beautiful happen. As with Code, Colors, Cookies the vision is to empower participant by letting them use technology creatively, trying things without fearing failure or fearing to break things. Our goal is not to teach “the right thing to do” or “the fundamentals”, but to allow kids and families to explore the creative possibilities of the basics of interaction. On the context: The workshop was continuous over 3 hours, from 3pm to 6pm. A drop-in event, kids and family could come at any point during the workshop hours, and they could go as they please. They were also invited to visit the museum to discover select artwork with a guide. It was also hard to predict beforehand the number of participants we would host at a single moment, and we had to be prepared for wide variations along the three hours. We ended with 250 to 270 participants – kids and parents. 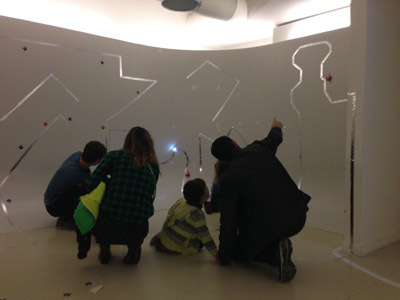 The workshop design revolved around three dedicated spaces in the museum, each hosting a different activity. and use their body and aluminum stickers to switch on and off conductive drawings on the wall and floor of the last room. We want participants to be immediately creative and to learn without risking them failing for obscure reasons, especially kids. We want to empower them to go further by themselves, without being limited by the blackbox effect of magical technologies. In the tech education community, we often call this double-bind “low floor, high ceiling”. Some great tools in the history of tech education that are low floor, high ceiling include for example the BASIC language and the Arduino micro-controller and IDE (Arduino may not be low floor for kids, but it was very low floor for artists and designers compared to previous micro controllers!). If you are organizing a creative technology workshop, your goal is to tear down the magic of technology so your participants can create magical things by themselves. If you hide the nature of the materials from participants, if you mask the inner working of the tools, they might be creative during the workshop but they won’t be empowered to do it by themselves, back home. A creative tech workshop must be doubly accessible: accessible because it’s easy to start and be creative; and accessible because it makes participants feel that they can do it again in their own living room or workspace. For a workshop with such a high number of participants, we need modules that are as barebone as possible, allow participants to come up with unprompted uses, hacks and improvements, and yet doesn’t punish them with unjustified technical difficulties. I came up with a solution I call Totem modules. 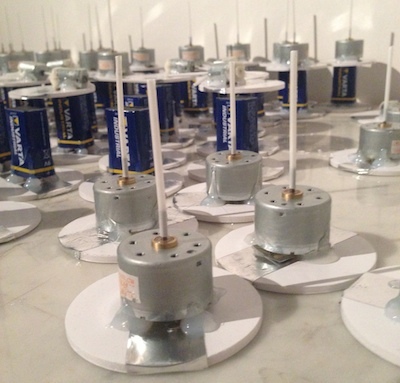 They give the electronics components a nice base, raising them up like little sculpture of their own. On the base is also found two large aluminum strips for connections. Totem modules stay at a very transparent level: circuit and components are clearly recognizable, with the goal of avoiding the “technology equal magic” black box effect. And it works well, as exemplified on the day of the workshop by parents asking us where they could buy motors and aluminum tape to “do it at home”. As said earlier, it’s very important to foster this type of reaction when you want to empower people to create with technology. Cost is a real issue when setting up a free, open workshop with ultimately 250 participants. Totems modules had to be cheap and easy to build with readily available materials. They use foam board and aluminum adhesive tape, and final assembly is done using a glue gun. I also had spare parts available in order to produce more modules on the spot if necessary. 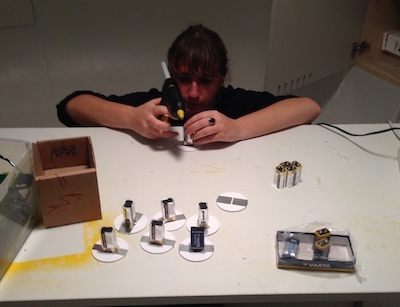 Fanny was able to produce her first 20 modules –10 battery modules and 10 motor modules– in 20 minutes or so, without any soldering necessary. The simplicity of the design made it easier to build these additionnal modules one hour before the start of the workshop. A paradox: cheap kits are important for people working in public institutions with many small, compartmentalized budgets. Such kits helps them move faster and try things, without loosing time preparing a complex request for additional budgets. Join and use Open Totem starting today! Totem modules can be used in many ways. We already tested two different activities during “Je suis une vraie pile électrique !”. 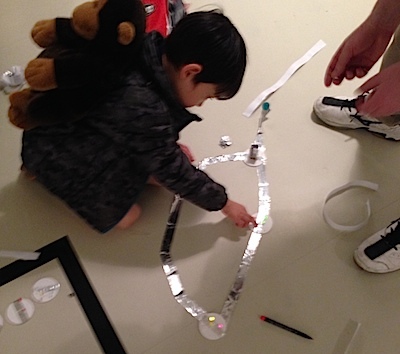 We learned that the modules can be connected by using crocodile cables, by putting them on a aluminum stripe, or by simply making them touch each others. There’s more to explore! 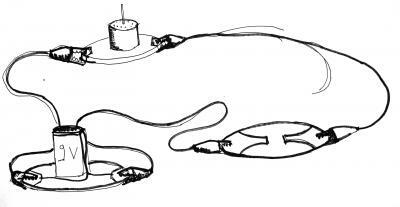 There’s new activities to invent and new modules to build - what about a inclination sensor module? What would be the simplest buzzer module possible? A fool-proof LED module that works both ways would be interesting to try with the younger kids. That’s why I’m launching Open Totem to share and improve Totem modules with educators, artists, workshop facilitators, hackers and… kids! You can help by building your modules, testing, creating new activities or simply spreading the word. If you want to learn more about Totem modules, build some for your own workshops or contribute new ideas, join us on http://opentotem.org – the site is a wiki under a CC-BY-SA licence, and you can register to edit, add and improve. You can also ask me any question on Twitter here. Thanks a lot to Juliette, Samuel, Martine, Daniel, Jeanne, Rachel, to Fanny and Marc from MMI Sorbonne, and to the Pompidou team: Odile, Marie-Claude, Malika, Benjamin, Isabelle, Esther, Malak, Marianne, Gabriela! Their contributions to the design, preparation and facilitation made the workshop possible.